Happy New Year to you all! It is really lovely to have the school buzzing again. I must apologise for not getting this Newsletter out at the end of last term, it was just so really hectic. Arun Festival in November Rosalind Dyer, Year 7, entered three classes and gained: a Silver Medal for her 86% (Commended) 2nd place in the Junior Classical Voice class; a Gold Medal for her 87% (Distinction) 1st place in the Junior Musical Theatre class; a Gold Medal for her 87% (Distinction) 1st place for her three songs in the Mini Recital Class. She was invited to take part in the Finals Gala Concert at The Steyning Centre Fletcher's Croft. Rosalind is going from strength to strength, congratulations! Splendid successes for these burgeoning young Speech and Drama pupils who have taken their first exams. Congratulation to them all: we look forward to things to come! The Choir was busy throughout the second half of last term, starting with Pre-Prep Harvest Festival and culminating with 14 pupils who sang with Worthing Choral Society at Bohunt College on 16th December. The Choir sang for both Carol Services and also at the Community Carol Service at St James the Less in North Lancing. The children all sang without music this year and produced an excellent sound. Many of our musicians passed their ABRSM and Trinity Exams and the results will be recorded in the next magazine. Our string-players attended a String Day at Lancing College and in the coming term our musicians will be attending a Young Voices Festival at Chichester Cathedral. Brighton Museum has a splendid Egyptian Gallery with many artefacts brought back by a Brighton resident when that sort of thing was acceptable! Years 3 and 4 spent a most enjoyable time delving into the past; which included a session of embalming. I was very impressed by how much our pupils already knew when they were asked questions by the museum staff and me! So well done Mrs Kelly for organising the trip and quite clearly firing the curiosity of her children during their studies. Our netball season has continued to flourish, where we have had matches for all girls from Years 4 to 8; the Year 3 girls will be experiencing their first matches in the Spring Term. The second half of the Autumn Term we had 2 wins, 3 losses and our U11 squad came 4th/6 at the Great Ballard Tournament, which is a good set of results for a school as small as ours. The girls are developing their teamwork skills and we are looking for more improvements over the coming term. We held a very enjoyable Inter-House Netball Tournament including the boys who have helped us out at breaktime practices. Romans were the overall winners. Plaques awarded at the end of term for : Most Improved Senior Player - Annabel Johnston; Most Improved Junior Player - Annabelle Owen. Girls' hockey started at half term in November and the girls are looking very good now. They are all dribbling and passing well. Tackling is becoming a firm favourite activity and shooting at goal is proving to be harder than it looks! We are developing small group games and the girls are slowly learning the rules of the hockey. Plaques awarded at the end of term for: Most Improved Senior Player - Rosalind Dyer; Most Improved Junior Player – Katie Boothby. Under 9s competed well in their matches but were unlucky not to win. They did finish 6th of 8 at the Seaford Tournament. Charlie Turner captained his side well and scored some great breakaway goals. Colts played in several close fought matches. Great win, 4-3, against Lancing College Hove where Man of the Match, Peter Gombera, scored a hat-trick. Another win came against Swiss Gardens, Shoreham, 6.-0, with a diving header by Austin Johnston. George Armstrong captained his side well. After a truly smashing Conker Tournament winners of the Golden Conker Tournament were: Millie B-N - Seniors, and George Armstrong – Juniors. On the evening of Tuesday 14th November a small group went to see the Nu Civilisation Orchestra at the Brighton Dome. 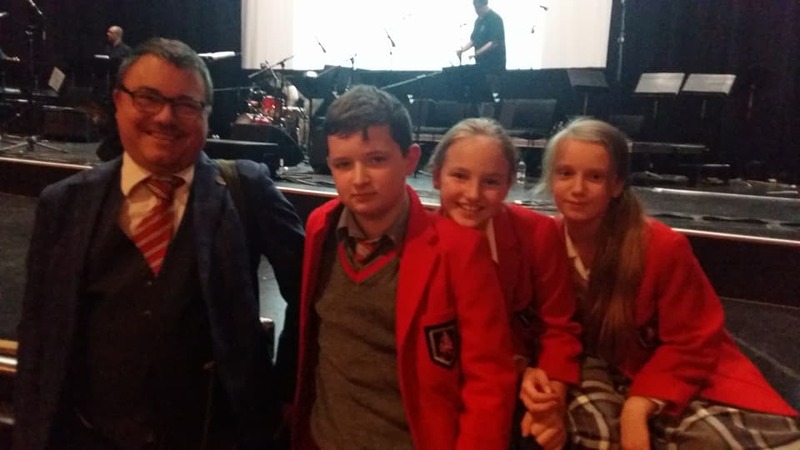 It was a late school night yet Mr Douch, Ms Farley, Thomas Crane, Poppy Coles and Ava Strafford ventured into the city to experience this celebration of Jazz music. The first half of the evening were singers and musicians from local schools that had been directed by members of the Orchestra to create some amazing pieces. The second half was the orchestra itself, which was mesmerising. Everyone felt that their spirits had been lifted by the evening and truly inspired. The Pre-Prep was been busy the second half of the Autumn Term. In November all of the children baked cakes and prepared bunting to decorate and fill the Activity Room for our Pre-Prep café in aid of Children in Need. We held two sittings; one for the Early Years children and their families and friends and another for PP3 and PP4. The children thoroughly enjoyed showing their families to a table, taking their orders and delivering their delicious cakes and biscuits. There was a wonderful atmosphere throughout the whole day and we raised over £220 from the very generous donations. A change of venue for the Christmas Nativity, Born in a Barn, the Assembly Room in Main school. The cosier, warmer and less daunting venue proved a huge success. The children worked so hard to learn their words and it really paid dividends; their voices were clear and everyone spoke with expression. As always, Mrs Williamson’s practice and talent enabled the children to impress us with some wonderful singing too. Thank you to everyone involved. The Christmas Fayre with Santa`s Grotto in the Old Stables was well attended. There were plenty of stalls and interesting activities for the children to get involved in which all helped created a wonderful atmosphere. Our big thanks to Mr and Mrs Kraszewski and SAPA helpers who worked so very hard to make it such a lovely event. Finally, you are welcome to come to the short panto that Year 7 put on for part of the Christmas entertainments after Christmas lunch last term. It is being performed in the Assembly Room on Thursday 11th at 4.00 - a little light entertainment! We look forward to a happy eventful Spring Term.